So far I've measured, cut and ironed the fabric, and just need to get out my machine to sew up the seam. I could do this by hand, but I really want it to stay. I plan to gather the fabric around the plastic and sew it up. Not sure what I'll embellish it with yet, but I'm going through my collection to see what works best. Finally I'll attach ribbon to the the underside so it doesn't irritate my wrist and looks more finished. In between helping take care of my DH this week, who had shoulder surgery yesterday, I'll work on it more tonight. Here's the cover (ta-DA) of my Art Journeybook. I know better than to call anything I do a journal or diary, as that word implies something that happens day-by-day. 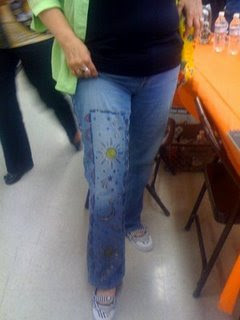 My journeybook details my art journey as I'm learning, especially while taking Suzi Blu's "Les Petite Dolls" class. I rather like the way this turned out. Everything, from the book itself to the papers and embellishments, was salvaged and/or scraped from a clearance bin: true Crafty Bag Lady style! Mine's been MIA for a while, but I'm getting back in the thick! 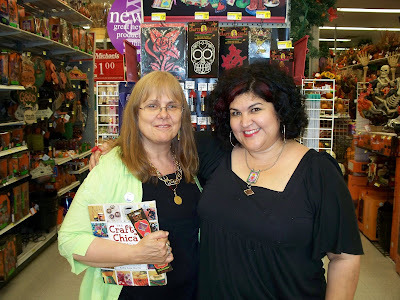 I saw The Crafty Chica, Kathy Cano-Murillo, on her Spread the Sparkle Tour in San Jose a couple of weeks ago. 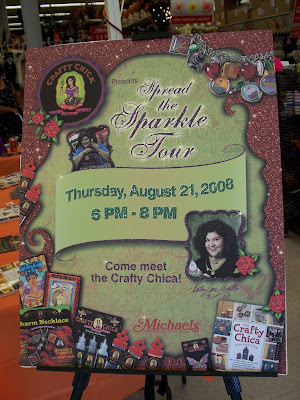 She and her very cool hubby Patrick were there to demonstrate her new line of Crafty Chica products now sold at Michael's. 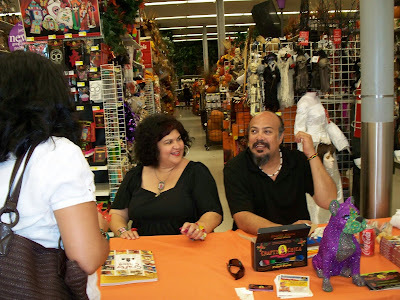 Although I'm not into skulls 'n' skeletons at all, I just love Kathy's bounce and glittery enthusiasm.